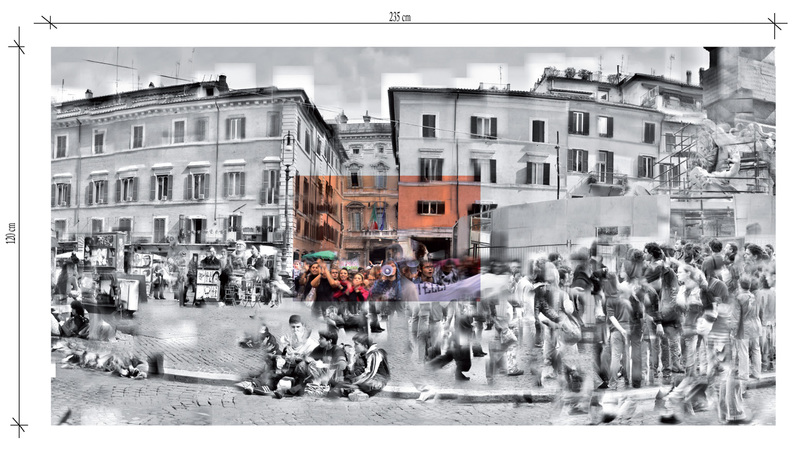 The “Picture the Multitude” series shows groups of people in urban public space. 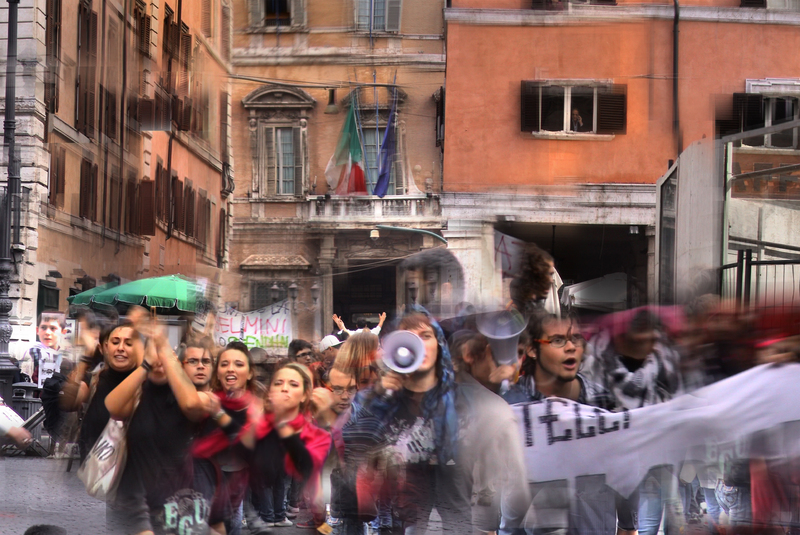 The term “multitude” identifies a multitude, which as a multifaceted network of relationships distinguishes itself from a shapeless and shapeable mass. The term addresses the diversity and variability that cannot be subsumed under a standardizing representation. (cf. Robert Foltin 2004, Und wir bewegen uns doch / Soziale Bewegungen in Österreich, p. 12). The “people/folk” or the classes are assumed, on the contrary, to have a uniform will that has also been and still is often staged in a propagandistic way. “Traditional ways of depicting the “people” or the masses have shaped a visual language in which singularities are generally represented as faceless groups, as living ornament. “Picture the Multitude” is a visual approach to the term “multitude.” In order to make diversity visible, a form of depiction has been developed that does justice to the web of relations rather than allowing the singularities to degenerate into an ornamental mass pulp. 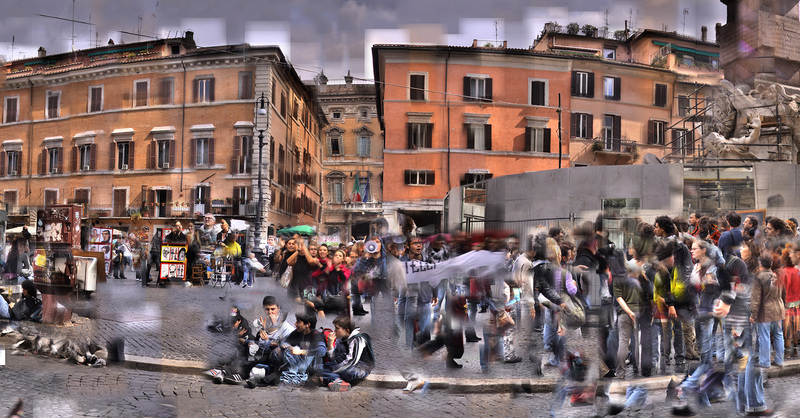 A central perspective is shattered through the conceptual departure from photographic and cinematic techniques. Details, movements, and the course of time thus become comprehensible while simultaneously yielding a sprawling view of the architecture. The working process commences from video recordings that follow a strict pattern, scanning a selected site over the course of several hours or even days. Freeze frames are taken from the thousands of chronologically recorded 30-second-long video recordings and are then joined together in an elaborate digital process. The pictures are made up of roughly four thousand carefully selected 13 x 18 cm individual images, which are digitally assembled to large formats. The series is conceived as a stock taking of architecture’s influence on individuals’ and masses’ performance in public space. Likewise represented is two-dimensional media’s failure in terms of space and time. The images that arise are both dynamic and intimate; countless fragmented gestures, faces, body parts, and details of everyday moments merge. The architecture professes the structure, people and moving parts surface shadow-like, growing together with one another and the still elements of the environment.